Plastic surgeons and skin care industry gurus think only surgical procedures or expensive medications are the best way to fight the sun's ultra violet radiation. However, this is not true. Knowledgeable alternative medicine advocates have a better solution. They recommend using products like Skinceuticals Phloretin CF instead. The reason being, that they contain natural clinically proven antioxidants. Antioxidants search your body for destructive molecules (free radicals) and stop them from damaging your healthy skin cells. These active ingredients are phloretin, l-ascorbic acid, and ferulic acid. One huge benefit of buying Phloretin CF samples is that opening one sample at a time permits the remaining samples stay fresh longer. The skin’s long-term exposure to the sun’s ultraviolet irradiation (UV rays) can lead to premature aging and skin cancer. Topical creams containing sun protection factor (SPF) help to prevent further UV damage, but cannot repair it. When combined, the active ingredients in Skinceuticals Phloretin CF proactively reverse UV skin cell damage. They can also help prevent new inflammation and damage (e.g., red spots, dark spots, and skin cancer) from occurring. An important plus offered when purchasing Phloretin CF samples is the price point – buying sample sizes or Pro size products can offer significant savings over purchasing the same one in its retail size. Ferulic acid seeks out and neutralizes free radicals caused by UV rays. This prevents new skin cell damage from occurring. Ferulic acid extract originates from various fruits and plants such as artichokes, oranges, apples, peanuts, and coffee bean seeds. • Speeds up the time required for skin tissue repair for faster healing and resolves hyperpigmentation (dark skin spots) to brighten ones complexion. • Stimulates the production of collagen fibers to restore the skin’s elasticity and firmness to decrease sagging and wrinkles for a more youthful appearance. • Neutralizes the effects of UV rays and other environmental factors to prevent future skin damage. People can digest Vitamin C naturally by eating various fruits and vegetables, but the human body excretes vitamin C quickly. So, it is difficult to ingest sufficient amounts of vitamin C to meet the increased demand when skin damage occurs. • Accelerates cellular replication to quickly swap genetically damaged skin cells with young healthy ones. • Diminishes existing hyperpigmentation for a more even skin tone. • Activates elastin creation to restore the skin’s elasticity and helps to prevent sagging. Phloretin extract is derived from apples and the bark of apple, grapefruit, and pear trees. Ultimately, there are many plastic surgery or skin care options on the market today. 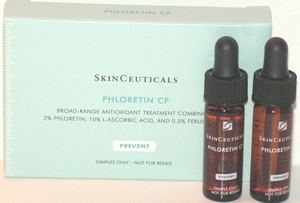 Skinceuticals Phloretin CF is a safe, affordable, and effective natural solution. But please take a look at some other advantages of purchasing Phloretin CF samples, besides the issue of maintaining freshness and great pricing; the smaller bottles make it easier to pack for travel, and one can be kept in your purse or in your locker at the gym or spa. And when friends take notice of how great your complexion is looking, you can generously turn them on to one of these sample sizes – why not share a great product with a good friend?